This one is a must in every high school library! I love the characters and the portrayal of the ups and downs of first love. SUMMARY: College-bound Dimple Shah is embarking on the opportunity of a lifetime: Insomnia Con, a summer program for pre-university students to develop an app and present it to Jenny Lindt, a famous software developer. If Dimple's app is selected, Jenny Lindt will sponsor the development and marketing of the app. Dimple is especially excited to escape her Indian-immigrant parents for a little while before she goes away to Stanford in the fall. She's excited about newfound freedom and no longer hearing about how "domestic" a young Indian woman should be. But Dimple gets the surprise of her life when, on her first day of Insomnia Con, a boy named Rishi proposes to her, saying he and Dimple were arranged to be married. 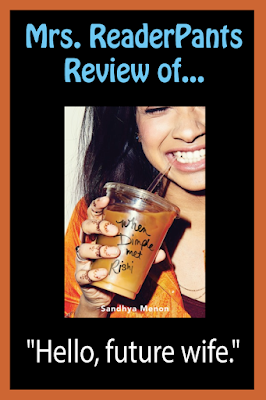 REVIEW: I don't have a whole lot to say about this one except that it's super-cute, and I think my students will love it. There are plenty of laugh-out-loud moments, and Rishi's traditional values are a great complement to Dimple's independence. I especially loved the clash between immigrant parents and their Westernized children, who are growing up with values very different from their parents. Speaking of the parents...how awesome are they? I love Dimple's mother's protectiveness and desire to preserve Indian culture and values within her daughter. IDimple's father is great as a calming force bringing balance to the the two strong women in his life. And I always love a YA contemporary with TWO parents actively involved in their teen daughter's life. Though Dimple has graduated high school and is away from home for the summer, Dimple still talks to her parents on the phone regularly. I highly recommend this for all high school libraries. Bonus points for the relatively clean content. THE BOTTOM LINE: It's cute and a lot of fun. A must for high school libraries. Drugs/Alcohol: very mild; some references to college students drinking. The two main characters do not drink.